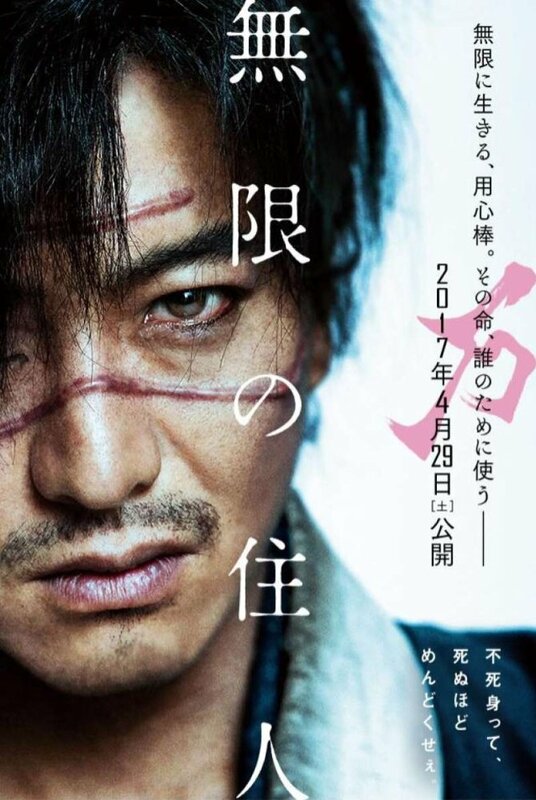 Magnet Releasing, the genre arm of Magnolia Pictures, has just posted the Red Band trailer for the upcoming film "BLADE OF THE IMMORTAL", based on the manga by Hiroaki Samura. The film is directed by Takashi Miike and written by Tetsuya Oishi. Takuya Kimura, one of Japan's biggest stars ("SPACE BATTLESHIP"), plays the lead alongside newcomer Hana Sugisaki. Sôta Fukushi and Ebizô Ichikawa ("13 ASSASSINS") round out the cast with veterans Min Tanaka and Tsutomu Yamazaki. "BLADE OF THE IMMORTAL" marks Japanese director Takashi Miike's 100th film ! The Blade of the Immortal manga was first published in “Afternoon” from June 25, 1993 to December 25, 2012. An anime adaptation was produced in 2008 as well as a Japanese novel. The American version of the novel was released in 2014. "BLADE OF THE IMMORTAL" will have its North American premiere at Fantastic Fest in Austin, TX (September 21-28). The film will hit theaters on November 3, 2017. Synopsis : Manji, a highly skilled samurai, becomes cursed with immortality after a legendary battle. Haunted by the brutal murder of his sister, Manji knows that only fighting evil will regain his soul. He promises to help a young girl named Rin avenge her parents, who were killed by a group of master swordsmen led by ruthless warrior Anotsu. The mission will change Manji in ways he could never imagine - the 100th film by master director Takashi Miike.